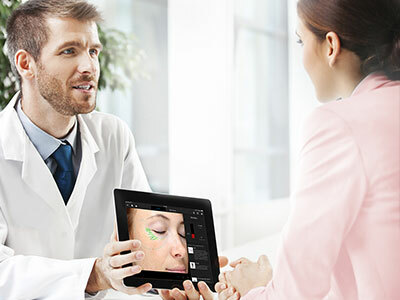 VISIA and Reveal apps display full featured consultation screens of client sessions, including single feature view, side-by-side comparisons, overviews and product recommendations. The Mirror app offers both 2D and 3D image viewing, on-screen white boarding, before-and-after comparisons and direct image capture with the iPad’s built in camera. And every app supports direct upload to Canfield’s ViewMyConsult® patient portal. A single iPad app license allows an unlimited number tablets to access the practice databases.